Constructed as Ersatz Brandenberg. Cost of construcrion 45 million marks. June 1918 re-named Kronprinz Wilhelm. Markgraf, König and Grosser Kurfürst. All action times in CETWhen König and the others were firing at the main british battle line, Kronprinz was still out of range and so concentrated on firing at the 2nd LCS. From 17:51 - 18:00 at ranges between 17,000 - 18,600 metres targeted HMS Dublin shifting her fire to Malaya at 18:08. She reported one hit (which Campbell disputes). At 18:30 she resumed fire for 6 minutes though with similar results. At 19:00 there was a british destroyer attack on the German line. 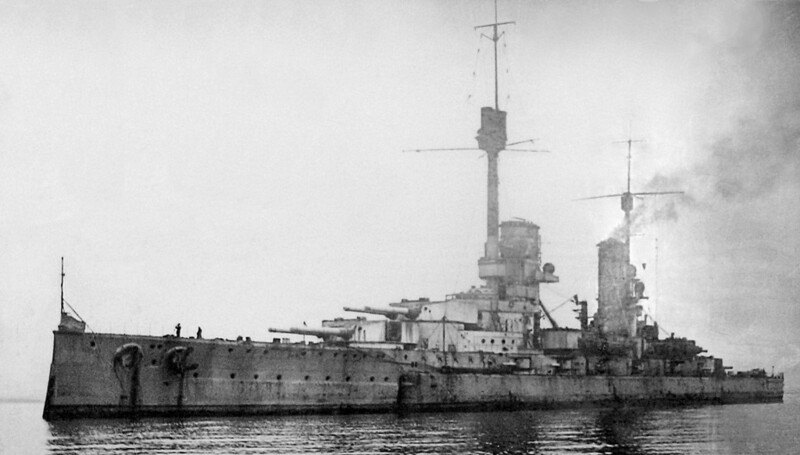 Onslow fired at Kronprinz from around 8,000 yards. Both torpedoes missed. Kronprinz was actively engaged in the fusilade against Defence and after she had gone down shifted to Warrior. Some people credit her with the shot that "killed" the Defence rather than Lützow. At 20:00 scheer ordered the line to turn eastwards to disengage slightly. Markgraf, which had engine problems, fell in behind Kronprinz. By 20:18 the line was being hammered and the British could not be made out. Scheer ordered the second Turn Away .Kronprinz&apos;s position in the line was reversed and she was near the back.In the night formation was the 14th ship. Attacked at around 02:45 by 6 british destroyers. Obedient fired a torpedo which exploded about 100 yards behind her. She was undamaged (though Faulknor and Obedient both recorded hits).SHe had fired a total of 144 heavs^y shells. Her secondary armament had not been used. 3 Parsons steam turbines with three oil fired and 12 coal fired boilers driving three shafts rating 43,300 shp.